With the extra hour of daylight we gained this week along with the unseasonably warm temperatures, you’ve probably enjoyed the great outdoors a bunch—and now you have a dirty dog to show for it. Bring your dog by Weber’s Pet Supermarket in Herndon from March 12-24 and get a great wash and help a GRREAT organization at the same time! For every wash, Weber’s will donate $10 of the $16 cost to Golden Retriever Rescue, Education and Training (GRREAT)! The dog wash is a self-service wash. The tub, water, shampoo, towels, high-velocity dryers and tasty treats are all provided! Weber’s Pet Supermarket is at 2599 John Milton Dr., Herndon, VA. 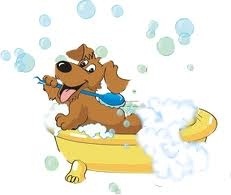 Hours for the dog wash are Mon.-Fri. 10:00 a.m. to 7:00 p.m. (last bath 6:30 p.m.) and Saturday 10:00 a.m.-5:00 p.m. (last bath 4:30 p.m.). Weber’s is closed on Sundays. There are so many options out there that I’m totally overwhelmed .. Any suggestions? Thanks a lot! I’ve enjoyed working in WordPress, although if you plan to blog from a tablet such as an iPad, it doesn’t work since you can’t upload photos on the iPad. I’d suggest trying a free platform first, then, if you can keep posting regularly and get subscribers and then find you’d like more features, explore paid options.